This review first appeared in the May 8, 1985 issue of The Daily Aztec. Coney Hatch is a lot like Firefall. Both bands are Top 40 acts that try to pretend they're rock 'n' rollers. Both bands have met moderate success at the national level without doing anything different from bands in the same vein who have never escaped the local scene. Where Firefall is content to play a mellow style of "soft rock" appealing mostly to adults, Coney Hatch seems to be aiming more for the teen market with a harder, harsher sound. But the music is no better. In fact, the only song off the band's latest release, "Friction," that even approaches mediocrity is "Wrong Side of Town." It's the closest thing to quality music on the album, as guitarist Andy Curran gets in a few imaginative phrases. Proving that lack of quality is no impediment to success these days, two songs from the album have been getting a lot of airplay of late. "She's gone" is a sugar-coated but listenable piece with a catchy melody and memorable refrain. Lead singer Carl Dixon handles the simple lines easily enough. The other song getting a lot of play is "Girl From Last Night's Dream," which also has a pretty enough melody. The rest of the album is about what you'd hear in the lounge of your local restaurant on a Saturday night  it's boring, flat and predictable. 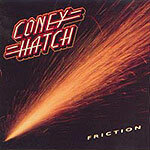 Coney Hatch remains a small-time act that has gained a national audience without any corresponding improvement in material or performance.